www.sausagemaking.org • View topic - Farm salmon in U.S. o.k. for curing? Farm salmon in U.S. o.k. for curing? I'm in the U.S. The farmed salmon we get has color added, and while it looks and tastes o.k., I wonder if anyone has had good or bad results curing it. Here it is around $8.00 u.s. per pound, where wild salmon, if we can get it, is almots twice that. I'm not living near the coast. I tried a small piece of farm raised, color added salmon with a cure of salt, brown sugar and black pepper, and it worked fine. Finished product was firm and the color was not affected by the curing. Taste was good, but I think wild salmon will probably taste better. I was worried that the added color would leach out or turn gray or something, but it didn't. Of course I prefer better salmon, but it is usally 12.00 u.s. a pound or more here. Are you sure it's coloured? I mean that it has colour added to it? I've never heard of coloured salmon. Yes, that's what I thought too. The labelling at the store says farm raised salmon-color added. I'm not sure how it is added, but I am told that normally, farm raised salmon has a grey-ish color to it. I am not sure whether that is only true after cooking or both before and after. I also don't know whether the color is added by the food they are fed. I may snoop around on the internet and see if I can find out if it's just the food they are fed, which would make me feel better about it. Can probably save you the energy by saying yes, it will be in the food they eat. It's natural plant extracts that they eat that make prawns, krill and shrimps pink, which the wild salmon eat and so pick up their colour. In farmed salmon they add the extract to the food. 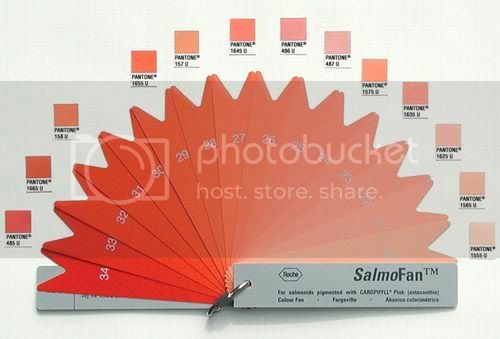 The suppliers have colour swatches like paint catalogue samples so you can pick what colour your salmon turn out. Saucisson: Thanks. It sounds strange, but it's better than what I imagined, which was giant vats of fish dye with pieces of cut fish floating in it. I'm guessing the labelling requirement is harsher than it needs to be in the U.S.
That color chart is awesome. Could probably take it to Home Depot to match paint for your room. larry wrote: Saucisson: Thanks. It sounds strange, but it's better than what I imagined, which was giant vats of fish dye with pieces of cut fish floating in it. larry wrote: I'm guessing the labelling requirement is harsher than it needs to be in the U.S. I can't speak for others, but in my country there is no such labeling. Many Rainbow trout in UK fisheries are also fed on pellets with these additives in them. The trout I catch at my local reservoir are deep pink in colour,just like salmon. When we serve Smoked trout to friends someone invariably comments on how much they enjoyed the Salmon. I was going to say that people eat with their eyes,but to be honest,even though I know it's trout it tastes the same as salmon to me. Not very refined taste buds I guess! Salmo wrote: When we serve Smoked trout to friends someone invariably comments on how much they enjoyed the Salmon. I've always thought that trout was a fresh water version of salmon. Anyone know? I almost always use farmed salmon for lox. If there's a sale on wild caught Pacific salmon, I buy it, and I find the texture denser. It's different, not necessarily better, but good nonetheless. I do find that the Pacific wild caught takes heavier smoke better, therefore also supports more intense flavour. Wikipedia wrote: Trout are closely related to salmon and char (or charr): species termed salmon and char occur in the same genera as do trout (Oncorhynchus - Pacific salmon and trout, Salmo - Atlantic salmon and various trout, Salvelinus - char and trout). Also,at least in England, Sea trout are sometimes called Salmon trout. Sea trout are geneticaly identical to our native Brown trout (Salmo trutta) but for reasons still unknown a small proportion decide to migrate to the sea,returning to fresh water, just like salmon, to spawn. I've only ever caught small sea trout,and always returned them,so have never got to taste this increasingly rare fish. Re: Farm salmon in U.S. o.k. for curing? In Tasmania here, all the farmed Sea Trout are Rainbow trout from what I was told, farmed in brackish water and sold fresh and cold or hot smoked. Some Sea Trout escapees do return to the sea and are called sea runners, they grow massive. crustyo44 wrote: In Tasmania here, all the farmed Sea Trout are Rainbow trout from what I was told, farmed in brackish water and sold fresh and cold or hot smoked. Fish do seem to have different names all around the world don't they? Get a Lobster dinner around the Med & you won't get any claws with it,what we would call in England a crayfish. I believe that Sea run Rainbows are know as "Steelheads" in the States. I doubt they exist around Britain as most of our "bows" are stocked into enclosed water,certainly never heard of any anyway. I think the biggest Sea trout (brown trout type) come from around the Danish coast,they also have some huge ones around the Falkland islands. Bit far a day trip though! !